French Agricultural Research Centre for International Development (CIRAD) and ILRI scientists met in Nairobi, 9-10 Jun 2015 (photo credit: ILRI/Paul Karaimu). 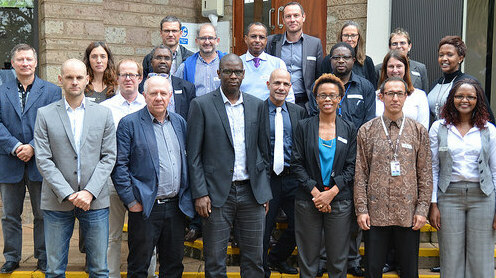 On 9–10 Jun 2015, a delegation from CIRAD, the French agricultural research and international cooperation organization, visited the International Livestock Research Institute (ILRI) in Nairobi. Led by Jacques Lançon, the CIRAD regional representative for East and Southern Africa, a team of eight scientists from CIRAD research units linked to livestock research in France, Kenya and Mozambique worked with a team of ILRI scientists to develop concrete ideas for collaboration between the two organizations. CIRAD research units in animal and integrated risk management, emerging and exotic animal disease control, InterTryp (host-vector-parasite-environment interactions in neglected tropical diseases due to trypanosomatids) and Mediterranean and tropical livestock systems were represented at the meeting by Alexandre Caron, Thierry Lefrançois, François Thiaucourt, Sophie Thévenon, Alexandre Ickowicz, Denis Bastianelli and Philippe Vernier. The two-day meeting followed a visit by Jimmy Smith, the director general of ILRI, to CIRAD offices in Montpellier, France, earlier in the year. The meeting concluded with an open seminar by CIRAD’s Alexandre Caron, who gave a presentation on ‘Disease ecology in multi-host systems at the wildlife and domestic interface: Concepts and application’. The research evaluated interactions between wildlife and livestock in national parks, conservancies and communal farmlands in the transfrontier conservation areas of Botswana, Mozambique, South Africa, Zambia and Zimbabwe. In one study, GPS collars were used to track the frequency and intensity of interactions between cattle and buffalo in communal areas and national parks and how these interactions influence the spread of foot-and-mouth disease and bovine tuberculosis. The researchers found a ‘clear relationship between incidences of foot-and-mouth disease in cattle and contact between buffalo and cattle’ in southern Africa. A different study has assessed the spread of avian influenza between wild birds and domestic poultry, with findings showing need to control contact between poultry and ‘bridge birds’, such as quelea, barn swallows and cattle egrets, through better management of food, water and roosting sites. Caron argued that a combination of ecological and epidemiological research is needed to study wildlife-livestock interactions so as to help researchers better understand and control the emergence and spread of animal diseases. Two approaches used to reduce disease spillovers in Southern Africa, he said, are providing separate water sources for domestic and wild animals to prevent their mixing in the dry season and strategic vaccination campaigns. Download the presentation by Alexandre Caron. Tags: CIRAD, TFCA. Bookmark the permalink.